It’s the late 1960s, and you want a car to race in what could be some of the most competitive wheel-to-wheel in the game, European smallbore prototypes. So, you set about sourcing a tiny prototype with a 1300cc engine. You’ve got a few options, but you don’t want to follow the crowd. You hear tell of German brothers Stefan and Wenzel Mannl and their tiny coachbuilding company SWM. “Why not?,” you say to yourself. It’s bound to be good. SWM started building cars in the early 1960s, usually for themselves and local racers to tear up the tracks of Germany. Vintage Racecar Magazine tells the story that just seven cars ever left the SWM factory, with the first six being tube frame, fiberglass bodied, and BMW-powered. This one was different. Looking for a way to scale their racing enterprise, the Mannl brothers went for a popular platform that was inexpensive and readily available. 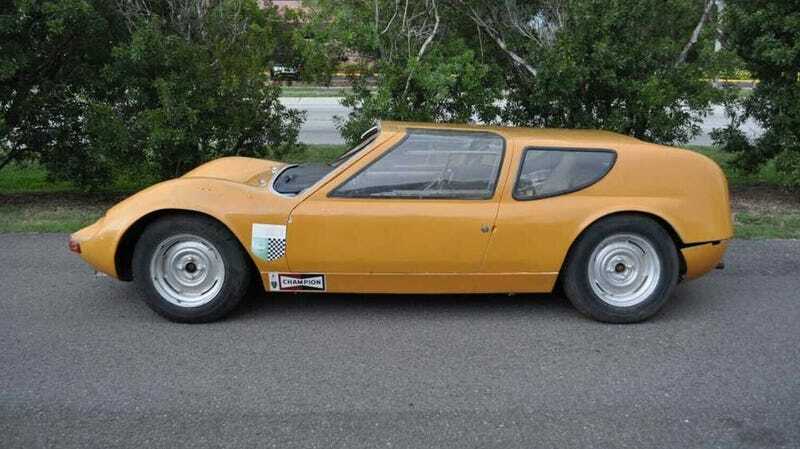 As such, they cut up a Renault R8 compact sedan platform, installed a short fiberglass body on it, and installed a hotted up Gordini engine and transaxle. The plan was to start cranking these Renault-based SWMs en masse, but a wrench was thrown in the works. The Mannl family had a successful carpentry business, and at the same time they went to a bank to secure a loan to grow that business. For the bank to take them seriously, the brothers were told they needed to give up their sports car lark. That was that, the seventh SWM had been built and the race car concern was no more. This is believed to be the last remaining SWM still intact. It’s not perfect, but most of it is there, and it could easily be restored and returned to one-time glory. What’s the point in showing up to a vintage race weekend with some Porsche 356 or whatever when there are ten more of them on track. Be unique. Follow your own arrow. It’s hard to place value on a one-off German race car from a group nobody has ever heard of with a tiny French engine and no provenance. If this had been powered by a Porsche engine, someone would have already paid six figures for it, but Gordini power doesn’t have the same pull. It may seem strange, but the buy-it-now price of $26,750 seems pretty fair to me. You’re buying a piece that will get people talking. That little Gordini motor is a ripper, too. If you’ve got a spare 50 grand or so to spend on buying and DIY restoring an old Franco-Germanic weirdo, I say go for it. You can see more photos and the full description of the car and its known history on the ebay listing.